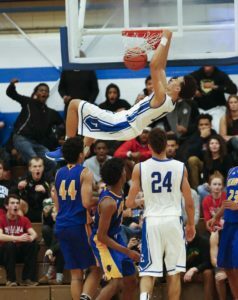 Eastern’s Chance Moore with a “get the crowd on their feet” slam dunk against Henry Clay. has transferred from Louisville Eastern to Louisville Fern Creek. Moore was a first team all 7-Region performer last season and has an offer from Samford University with interest from a number of other mid-major schools.